They wanted to pass this resolution, already in the handouts at the beginning of the meeting, without even waiting for citizen comments. They did listen first to a few people who had signed up to to talk about the compressor station, including WWALS member David Shields, whose family has an organic farm and discovered they’d be downwind of the compressor station, and Johanna deGraffenreid, the new Gulf Coast Campaign Coordinator for Gulf Restoration Network. Everybody else got to speak later in the meeting. 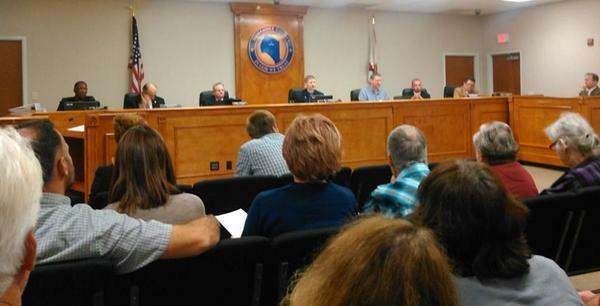 Here’s what the Board of Commissioners of the one county targetted by every proposed path of the Sabal Trail fracked methane pipeline passed last night, in front of a packed house. It was actually adopted 17 November 2015, and a signed and stamped copy is expected within a few days. WHEREAS, the Board recognizes the increased net change in potentially affected residential properties and desires to express the concerns of its citizenry to Sabal Tail Transmission LLC. 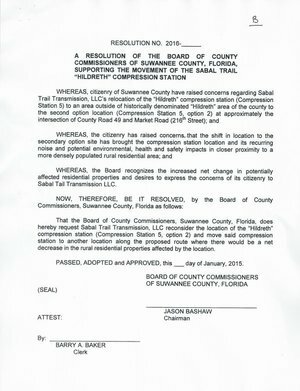 That the Board of County Commissioners, Suwannee County, Florida, does hereby request Sabal Trail Transmission, LLC reconsider the location of the “Hildreth” compression station (Compression Station 5, option 2) and move said compression station to another location along the proposed route where there would be a net decrease in the rural residential properties affected by the location. PASSED, ADOPTED and APPROVED, this _ day of January, 2015. This entry was posted in Law, Pipeline, River and tagged Aquifer, Chris Mericle, conservation, David Shields, Deanna Mericle, Debra Johnson, Floridan Aquifer, Ginger Shields, Gulf Restoration Network, Johanna deGraffenreid, Law, north Florida, pipeline, river, Sabal Trail Transportation, Santa Fe River, south Georgia, Spectra Energy, Suwannee River, watershed, WWALS, WWALS Watershed Coalition on November 18, 2015 by jsq.